One quintessential German experience that I've come to love is that of sitting outside in a biergarten (literally "beer garden") on a summer's day enjoying a cold beer and chatting with friends, which is just the experience that I had today. Though we were saying goodbye to a friend and coworker who's leaving the school for a new adventure, it was hard to be too sad when we were surrounded by good friends, good food, and good weather. Open only from about April/May through October, biergartens combine the German love for the outdoors and beer. Most have long, wide picnic tables to accommodate several close friends or acquaintances, as well as a play area for the children, making biergartens a relaxing location for the whole family. Our choice tonight was a rather large establishment in Leinfelden called Schwabengarten. Unlike some other biergartens that I've been to, this one works the traditional German theme with timber buildings and even a maypole. Most of the tables are outside, of course, but they do have a few covered ones under open timber roofs. The food, like at most biergartens, is traditional German fare. You order your beer or food at the counter and bring it back to your seat. While I enjoy a good pils at the Wasen (Stuttgart's version of Oktoberfest), my usual favorite is the hefeweizen (meaning "yeast wheat"). It's a bit heavier, but has more flavor than a pils. Each restaurant or bar in Germany is sponsored by one brewery, and so Schwabengarten served Paulaner beers on tap. My Paulaner Hefe Weißbier was predictably crisp and refreshing in the warm weather. They also had pils and dark beers, as well as wine, some cocktails, juices, and sodas. For food we ordered wilde kartoffeln (wild potato fries) served rot-weiss (literally "red-white") with mayonnaise and ketchup, which has been a new preference of mine since moving to Germany. I also ordered my first schweinshaxe (pork knuckle) with sauerkraut and semmelknödel (a bread dumpling) in a dark sauce. The pork knuckle was delicious: tender, fall-off-the-bone meat with a crispy, smoked layer of fat. The sauerkraut was also rather tasty with flecks of ham, and the dumpling even looked like it might have had some bacon in it. Schwabengarten also had some other traditional favorites on the menu, like schnitzel (fried pork cutlet), maultaschen (a kind of stuffed, rolled pasta found in southern Germany), spätzle (small egg noodles often served with butter or cheese), various German sausages, and flammkuchen (thin bread traditionally topped with crème fraîche, onions, and ham). A few of my friends ordered the flammkuchen, which looked really good, but the schnitzel looked a bit like it had come from the freezer. 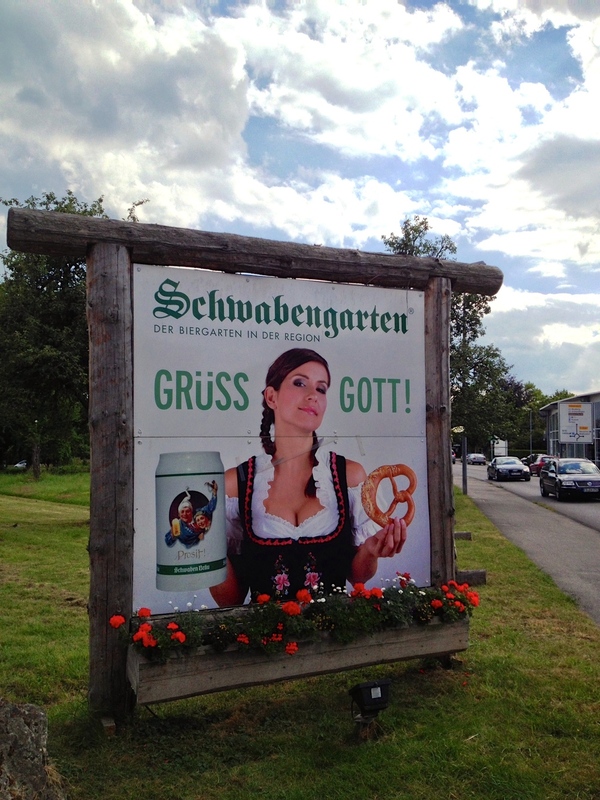 If you're looking for a traditional biergarten experience, definitely check out Schwabengarten. It's an easy, 5-minute walk from the U5 U-bahn stop at either Leinfelden or Unteraichen, and they have a large parking lot for drivers. Schwabengarten is open from 11:00 am to 11:00 pm, but check online to make sure the weather is nice. Dogs and children are welcome. Tip: If you go during the world cup, you'll also get the chance to see the games on the big screen. However, if Germany is playing, you'd better go early or call ahead to catch a table and leave your dog at home. Be sure to wear your black, red, and gold!